IVC filters, which are devices designed to capture blood clots before they enter the lungs, are getting some negative attention in the legal, and medical, community lately. While the filters were created to prevent life-threatening pulmonary embolism, they actually have devastating side effects. In a report released in 2010, the FDA received more than 900 reports of adverse events linked to IVC filters. 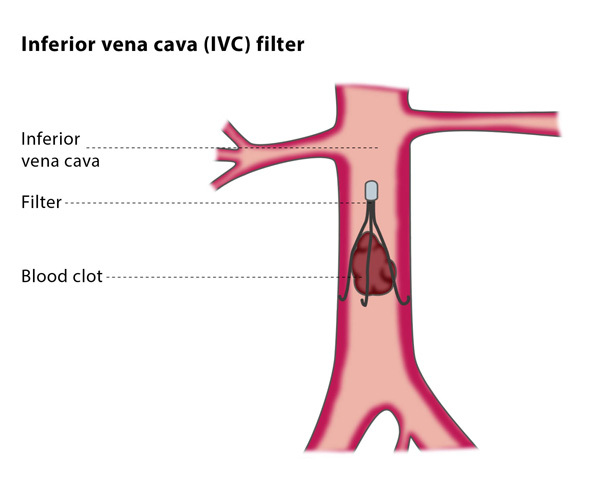 In 2013, a study was done that looked at the indication, complication and management of IVC filters in 952 patients in a trauma center. Nearly 680 retrievable IVC filters were placed in patients. There were 608 patients who did not have the filters removed. Approximately, 58 patients had their filters properly removed. In 2004, Bard began to receive reports of device malfunctions with allegations that the struts or legs of the device are easily broken and can migrate to other parts of the body, potentially causing serious injury. Bard decided to hire a litigation consultant, Dr. John Lehmann, to prepare a report that compared the fracture and migration rate of the new filters to previous models. While Bard knew of the problem with the IVC filters, they didn’t disclose this fact to the FDA. After receiving hundreds of adverse event reports about the IVC filters, including migration, embolization, perforations, and filter fracture, the FDA decided to issue a safety advisory regarding IVC filters in August of 2010. The purpose of the Lehmann report, which was submitted to Bard in December 2004, was to provide legal advice to the company about its IVC filters and provide assistance for anticipated and ongoing lawsuits. In a December 2012 lawsuit, which involved the G2 inferior IVC filter, Bard accidentally revealed the Lehmann report along with 11 others during the discovery process of the case. A week later, lawyers requested that the plaintiff destroy or return the documents that were mistakenly disclosed. The defendants then asked for a protective order to require the plaintiff’s attorney to destroy all copies of the Lehmann report and prohibit them from using the contents in the case. Although, in August 2012, a California state court denied Bard’s request for a return of the documents. There have been several conflicting rulings on the issue of whether the Lehmann report is covered under the work-product doctrine or not. Regardless of whether court rulings denied or approved the Lehmann report, the fact that Bard went to great lengths to hide this report from the case is concerning. They intended to hide the findings of the Lehmann report in order to have less damage done to their company in the midst of lawsuits. They continuously chose profits over people.